Dr. Vinod Kumar P. completed his MBBS from Govt. Kilpauk Medical College, Chennai, in 2000 and then went on to the United Kingdom for his higher training. He completed his basic surgical rotation through General Surgery, Neurosurgery, Plastic Surgery, obtaining his MRCS. Following this, a clinic research degree was done in Orthopaedics, obtaining MSc (Ortho) from Teesside University. During this time he also completed the Diploma in Sports Medicine from the Royal College of Surgeons, Edinburgh and Certificate in Management (Health & Social Care). He then got an entry into the type 1 Orthopaedic Residency Programme with the Yorkshire Deanery, UK and completed 6 years of rotations through various sub-specialities of Orthopaedics, including working at level 1 trauma units at Leeds and Hull, passing the FRCS (Tr & Orth) and obtaining the CCT. He had also undergone 1 year higher training fellowship from the prestigious Nottingham Shoulder & Elbow unit. Following this, he worked as a substantive Consultant at the St. Helens & Knowsley Hospitals NHS Trust and then moved to India, working as a Consultant, at Aster Medcity, Cochin, a 450 bedded JCI accredited institution. 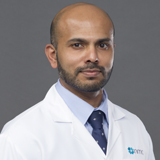 Dr. Vinod is a member of the British Elbow & Shoulder society (BESS), the American Academy of Orthopaedic Surgeons (AAOS), the Indian Arthoscopy Society (IAS) and a Fellow of the International College of Surgeons (FICS). He is a certified ATLS provider and a member of AO trauma. He has over 20 full article publications in peer reviewed journals and has rendered numerous presentations in International meetings and conferences. Dr. Vinod specialises in Shoulder, Elbow, Knee Surgeries, Arthroscopy and Sports related injuries. Dr. Vinod can speak English, Hindi, Tamil and Malayalam.